The best Rainbow of the season was landed this week. Ian Dalby of Uppingham took a superb 5lb 10oz Rainbow off the bank. It has been a steady week with some days better than others. Bank anglers caught well around the Old Hall, Church Bay and Normanton whilst boat anglers took fish off Gibbets Gorse, Church Bay, East Creek along the fishing lodge frontage and the Old Hall. The first three days of last week saw bright conditions and light winds, with a lot of the bottom breaking up and putting plenty of colour into the reservoir. The best areas to catch fish were upwind in the clearer water, but with very little wind this made things more difficult. Thursday saw heavy rain hit the reservoir early morning, this was coupled with a very strong northerly wind – this helped tremendously in reducing the coloured water. Friday was settled. Strong winds and heavy rain hampered fishing last weekend, particularly in the Main Basin. However those boat anglers braving the conditions last Saturday took fish. Most notable of these were Rutland regulars Dave Critchlow and Frank Sumnall from Stoke on Trent. The pair had twelve fish very close in to the shoreline. Lures are working best with some fish falling to nymphs. Plenty of food is available with some fish showing an increased interest in this season’s seemingly large numbers of shrimp. Buzzers are also evident as are corixa, daphnia, fry and sticklebacks. One fish was found to have had two Bull heads as well as many shrimp included in its diet! 2,500 quality Browns and Rainbows were stocked last week bringing the season’s total to 14,600 with another 2,000 Rainbows going in on 31 March. Wednesday 1 April sees the end of Winter restrictions around the shoreline and the sailing limits, allowing bank anglers to fish off the bank at the Sailing Club up to Gibbets Gorse, then the Green Bank to Old Hall, Dickensons Bay through to the Transformer and from the east side of Armley Wood all the way round to Inman’s Spinney. Boats will now be allowed to fish right up to the top of the North and South Arms. Brown trout are back in season from 1 April, please remember that it is a one fish limit per day per angler. Best methods Bank – floating/intermediate lines with lures/nymphs. Boat – Various sinking lines, midge tips. Best Rainbow 5lb 10oz taken by Ian Dalby of Uppingham. Club , East Creek, Gibbetts Gorse. Mid week boat winner Doug MacNicoll of Oakham. Beginners courses 2,8,18 & 25 April; 2,9,23 & 30 May and other dates throughout the season. 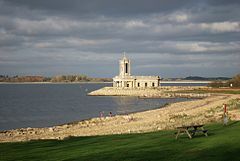 Grafham Water has continued to fish well for both bank and boat anglers with a good rod average of 4.8 and 25% of the trout caught weighing 3lb or over. Bank anglers have again enjoyed a really good week’s sport with most areas on the reservoir producing good consistent fishing. 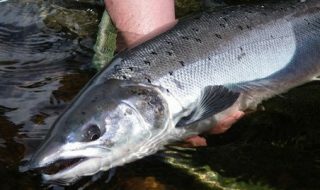 The most prolific methods for the bank anglers over the past week have been to fish floating or intermediate lines with black and green lures, diawl bachs, damsel nymphs, white boobies and tequila blobs. The best areas for the bank anglers over the past week have been Willows, North and South Dam, G Buoy, Marlow Stones, Deep Water Point, Pig Bay, Hill Farm and Gaynes Cove. Boat anglers have also had a great week’s fishing mainly along the Northern shore of the reservoir close into the margins. The best methods for boat anglers are to fish slow or medium sink lines with black and green lures, Tequila Blobs, Diawl Bachs, Cats Whisker, Booby, Cormorants, Snakes and GRHE. The most productive areas for the boat anglers have been Willows, North Dam, Marlow Bay, G Buoy, Pylon Point, Pig Bay and Hill Farm. 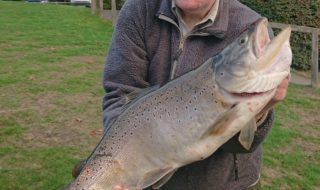 From 1 April the fishing restrictions at the western end of the reservoir are lifted and Brown trout are back in season (one Brown per bag). Please be aware of the bio security measures on the reservoir. Best Rainbow 4lb taken by B Walters from Haslingfield. Best boat areas G Buoy, Pig Bay, Hill Farm, Pylon Point, Willows, Marlow Bay, North Dam. Best bank areas North and South Dam, G Buoy, Deep Water Point, Willows, Pig Bay, Hill Farm, Gaynes Cove. Mid Week Boat Winner Malcolm Reece. Beginners courses 4,11,16 & 26 April; 3,17,24 & 28 May and other dates throughout the season. Anglers continue to experience fantastic sport on Ravensthorpe Reservoir with both boat and bank anglers filing spectacular returns this week, despite some adverse weather conditions. The best fish of the season to date was taken by Kevin Daykin of Hollowell, Northampton. It took Kevin 10 minutes to land the exceptional 14lb 1oz Rainbow from Platflorm 12 with a size 10 black buzzer fished on a floating line. Another excellent specimen weighing 11lb 4oz was caught by Colin Fraser on Tuesday 24 March. Colin was boat fishing at the Causeway end, intermediate line cats whisker. During the week 79 anglers caught 882 fish, of which 758 were returned. The rod average for the week was 11.2. The best boat areas were from Catwalk Corner to the Island and Causeway Bank between Coton Car Park and West End. Anglers caught fish at all depths, using floating and sinking lines with buzzers, diawl bachs, Pitsford Peas and Cats Whiskers working best. Mr Owen from Staffordshire returned 46 fish on one visit, and similar large returns were recorded by visitor Malcom Berry and season ticket holders Pat Flynn and David Brady. Bank anglers have also been enjoying great sport with Platforms 4 to 7 and 11 to 14 the best areas. Buzzers are now coming to the top of the fly list. Best Rainbow 14lb 1oz taken by Kevin Daykin of Hollowell, Northampton. Best boat areas Catwalk Corner to Island, Causeway (between Platform 12 and Coton End). Best bank areas Platforms 4,5,6,11,12,13 and 14. Mid week boat winner J Revell of Frodsham, Cheshire. The weather has made conditions challenging for our anglers both on the bank and off the boat this week. We were pleased to welcome a group of hardy police anglers who braved the wind on Thursday to take part in their friendly annual competition. The fish have been full of daphnia with an orange hue and some anglers have had success catching using buzzers as the weather warmed up slightly. The fish have stayed deep and off the bank but good quality fish have been caught using fast glass line di5/7 using green and black patterns, blobs and boobies. There has also been a fair amount of success using blood worm patterns. Congratulations to Terry Pancoust who had the largest catch over the week – 39 Rainbows of various weight. Best bank areas Northfields Shore, Stone Barn Bay, Gravels, Duffers, Stilton Point, Sailing Club Bay. Mid week boat winner George Hackett. Beginners courses 5,12 & 24 April; 7,10,16 & 29 May and other dates throughout the season.